This was one I really enjoyed putting together. When I read the devotion that went with the Word for this challenge a story I once read came to my mind. 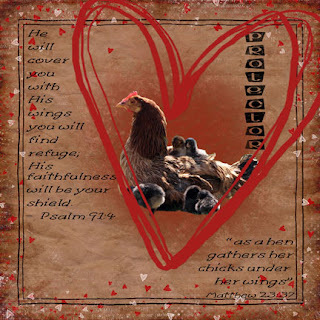 The story was about a mother hen protecting her chicks during a fire in the farmyard... she covered them with her wings.. she died but they survived. I found the photo of the hen and chickens somewhere on the internet. The digital kit I used was Counting the Ways by Heidi Williams.